During the winter in the year 1986, Deng Xiaoping sent John J. Phelan, Jr. of the New York Stock Exchange a priceless gift - a stock certificate issued in Shanghai. China was entering a new age in financial reform and at the forefront is Pudong. This is a story about the young people during that time. Zhao Haiying (Zhang Bo), Xie Tianyang and Chen Menglei have ventured out into the financial world hoping to catch up with the seismic change befitting the times. Xie Tianyang is an exchange student who becomes Zhao Haiying's biggest opponent. 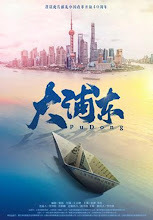 The banking industry is in danger and Zhao Haiying becomes embroiled in an act of fraud at a grand scale. He finds that his morals and values are tested time and again because of the difficult road ahead. The crew built an entire street to recreate the old streets during the 80's and 90's. Let us know why you like Pudong in the comments section. Please also share these fun facts using the social media buttons below.